After quinoa’s popularity went mainstream in 2013 when the Food and Agriculture Organization of the United Nations declared it to be the International Year of Quinoa, the concept of ancient grains began to resonate with consumers. In response, food manufacturers started getting creative with these whole grains, many of which allow for gluten-free product development. Ancient grains are defined as grains that have been largely unchanged since the beginning of time. This definition suggests modern varieties of corn, rice and wheat, which are products of years of selective breeding, are not ancient grains, according to The Whole Grain Council. Ancient grains tend to be richer sources of nutrients than modern grains; in particular, richer in fiber and protein, as well as many vitamins and minerals. Though ancient grains are popular in baked goods and cereals -- foods where one expects to find grains -- they are also finding their way into meals and side dishes, often in combination with plant proteins, namely pulses, according to Packaged Facts, Rockville, Md. Pulse-based ingredients are particularly valuable in improving the nutrient quality of gluten-free products, many of which are now being made with ancient grains instead of nutrient-void gluten-free staples rice and tapioca flour, as pulses and ancient grains complement each other from nutrition and sensory perspectives. 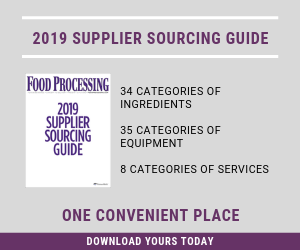 “For food processors, these ingredients provide whole-food, plant-based protein sources that enhance appearance, deliver unique tastes and textures, pack a nutritional wallop, and invite variety and innovation,” says David Sprinkle, research director at Packaged Facts. “We know vegetarian and flexitarian dietary patterns are continuing to trend. This is driving the popularity of nutrient-dense ancient grains” ~ Jane Dummer, registered dietitian and author of The Need for Seeds. Ancient Harvest heat-and-eat Organic Quinoa is a high-protein, clean-label meal or side dish that goes from pouch to microwave to table in 90 seconds. The line includes Organic Quinoa with Sea Salt, Organic Quinoa with Chickpeas and Garlic and Organic Quinoa with Lentils and Garlic. The 8-oz. package provides two servings, with 8-11g of protein per serving. The product is made with coconut oil, the tropical superstar of the oil world, and is free of gluten, GMOs, rice and fillers. Ancient grains are often used to make gluten-free baked goods. La Tortilla Factory uses whole grain ivory teff to make its Gluten Free Wraps, which contain 3g fiber and 18g of whole grain per serving. In addition to teff, the new and improved recipe relies on tapioca and brown rice flours, as well as a number of hydrocolloids to achieve desirable texture and shelf life. The company suggests heating before eating for optimal flavor and eating experience. As a snack or side dish, new Millet Tots from Rollin Greens are a whole-grain alternative to tater tots. These frozen, bite-sized tots come in three varieties: Italian Herb, Original and Spicy-Sweet. The vegan, non-GMO tots are made with organic millet. They come in 11.5-oz. boxes, which contain about four servings. A serving is seven to 10 tots, depending on variety, with a serving containing 1-2g fiber and 3g protein, nutrients typically unavailable in the traditional potato version. What Does Sprouting Add to Grains? Will include quinoa, spelt and Kamut, as well as its signature oats.